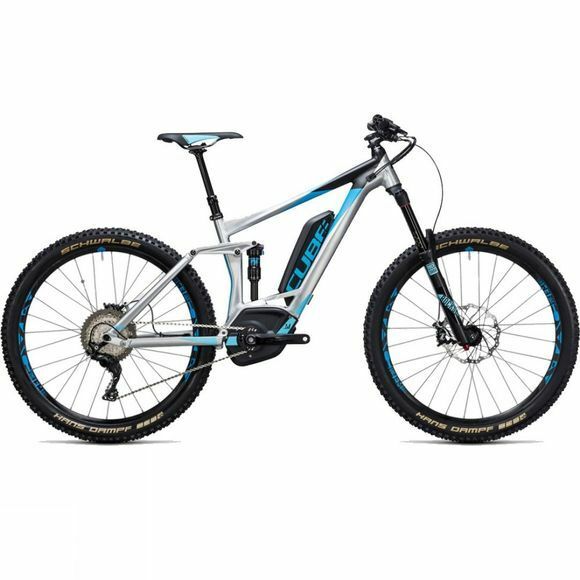 If you thought the Cube Stereo Hybrid 140 demonstrate the enormous potential of an all-mountain E-bike, the Stereo Hybrid 160 will absolutely blow you out of the water. This bike will dissolve the boundary between uphill and downhill, allowing you to push the limits right to the wire. Cube have gotten it right! At the heart of this ground breaking bike is the complex High Performance Aluminium frame. The chassis not only looks stunning, but also hosts an outstanding stiffness-to-weight ratio using state-of-the-art hydroforming technology, triple butted tubing and Cube’s own Smooth Welding Process technology. Their Optimised Agile Trail Geometry gives this incredible bike a lower centre of gravity and increases manoeuvrability for an awesome agile ride that will have you breezing down even the toughest of trails. And, with a compact Trail Motion Rocker linkage, there's even room for a shock with piggyback reservoir. Its incredible Bosch CX drive unit delivers up to 75Nm torque, helping you sail up the steepest of climbs. Combine this with a 500Wh battery and the result is an incredibly efficient system that will not let you down. Thanks to Tuned Drive Position technology the drive unit sits in an optimum position, allowing for a shorter wheelbase, which translates into even better agility. And if that isn’t enough Cube have incorporated a 148mm Boost rear hub that provides the stiffness needed to cope with greater speeds downhill. This stylish bike is completed perfectly with a robust 150mm Dropper Post and internally routed cables, keeping them safe from damage and adding to the bikes stunning appearance. Cube have made absolutely no compromises on the performance of this incredible bike.